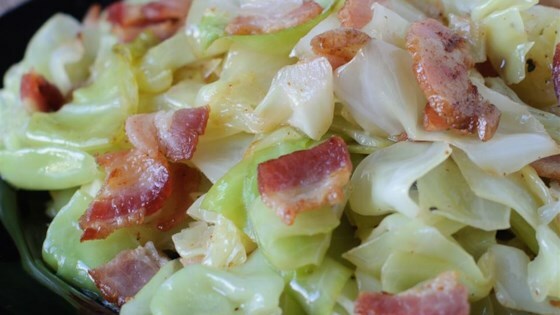 "Cabbage fried in bacon grease with bacon." I live in the South and this recipe is a staple in all households. There is nothing better if you like cabbage. Thanks for sharing. I love this recipe but I put onion and green peppers in the bacon drippings until they soften and then add the cabbage. My grandmother used to make this for our Sunday dinners, so when I used this recipe, it sure brought back some pleasant memories! Thanks! We make this adding onions and noodles boiled in chicken broth, Very good!!!! My mom was from the south, we also ate this all the time. She later added tomatoes and we ate this over rice. Brings back plenty of memories. After reading other reveiws I added 1/2 teaspoon brown sugar & some onions. Super excellent!!!! Also added this to mashed potatoes to make a pretty good colcannon.